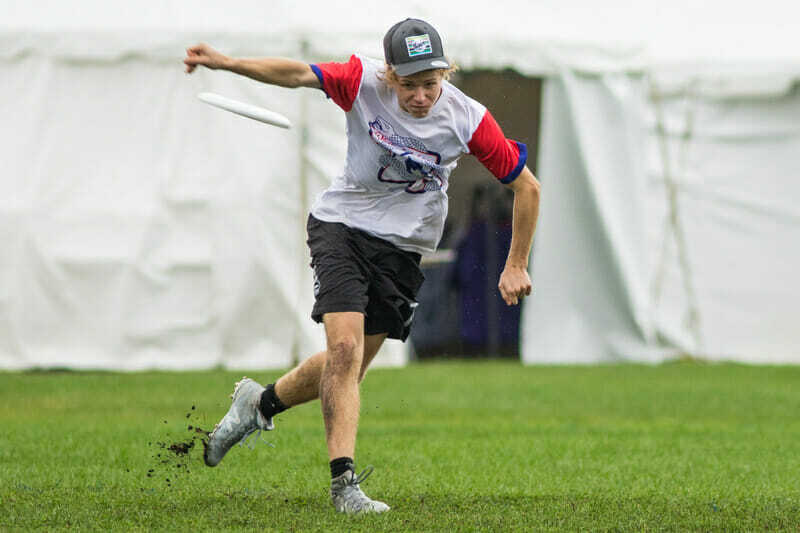 Ultiworld’s coverage of the Youth Club Championships is presented by CUT Camps; all opinions are those of the author. Please support the brands that make Ultiworld possible and check out CUT Camps! The Youth Club Championships got underway Saturday, and teams were greeted by harsh blasts of wind and consistent precipitation that varied in intensity. That meant young clubs were forced to find ways to make adjustments and stay focused. With two rounds of play to navigate, the participants got to get their feet wet, literally and figuratively. No. 1 seed Warhawks (NC) blitzed their competition in their two opening games. Their +22 point differential was second in the division, earned with wins over Hypnosis (IL) and cATLanta (GA). Both of those squads landed at 0-2. Unsurprisingly, Beth Manturuk’s throws in the wind and Margaret Barry’s athleticism were both a cut above, but the whole team was contributing to the Warhawks’ success. California Current, the no. 17 seed, surprised with a 2-0 day, putting themselves at the top of the standings after a narrow 9-8 victory of Colorado Cutthroat. A late break by Colorado brought them close, but the hard cap halted any comeback attempt. With Warhawks still set to lineup across from both Current and Cutthroat, the pool’s advancement positions are up for grabs. But the powerful Warhawks don’t look likely to concede anything easy. Texas Tango locked up the top spot in Pool B with a 2-0 performance on Saturday. The no. 7 seed both Valley Ultimate (MA) and Swarm (UT) by three point margins. Brianne McLemore and Skye Fernandez anchored a strong core for Tango. Meanwhile, no. 2 Superior (MN) fared poorly in the windy conditions and had trouble establishing rhythm. Their -18 point differential has to feel disappointing. 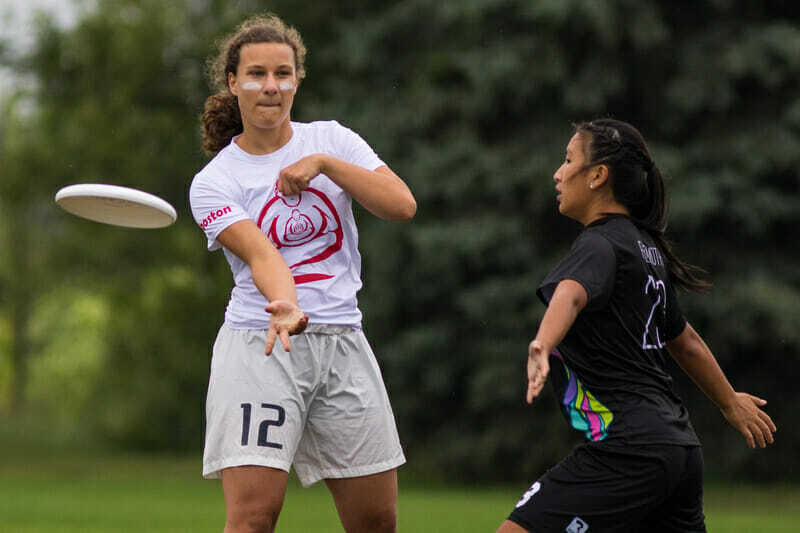 Valley Ultimate and Swarm square off Sunday morning to decide who advances into the championship bracket, while Tango take on Superior in a game for pride. With no. 3 DC Rogue and no. 6 DiscNW Sauce (WA) in this grouping, Pool C was supposed to be about the two powers clashing. But that was narrative was overshadowed by the division’s most surprising upset: AÉRA (Quebec) over Rogue, 12-10. There were hints the Montreal club was a threat after they hung tough with Sauce in an 11-7 loss in round one. The game between Rogue and AÉRA was spirited, intense, and close throughout. Rogue had a chance to force double game point trailing 9-8 with the cap on, but couldn’t secure the necessary hold. AÉRA’s Pénélope Robert, a U20 representative for Canada, was a challenge for defenses to contain. The matchup between Rogue and Sauce still will be one of the most anticipated matchups of the division and could still decide the pool. But Pool C is more than just two top teams. BUDA (MA) and Belle (OH) carry impressive point differentials into Sunday after strong 2-0 starts to the tournament. Belle’s 11-6 win over Moxie (PA) and 15-3 victory over Philadelphia Forge were solid, though outdone by BUDA’s performance. The Boston team conceded a single goal in their two games. Caroline Tessy and Tess Johnson proved to be influential players during their points, but BUDA’s overall strength helped them earn short fields and score upwind breaks. It will take a very strong effort from Belle to unseat BUDA in their matchup tomorrow, but both teams are set to advance into the championship bracket. Pools A and B are power pools of the tournament’s top eight seeds, with all teams making the bracket but the top two earning byes into quarterfinals. Pools C and D contain seeds no. 9 through 16, with the top two in each advancing to the prequarters. No. 3 MN Superior was very strong on Saturday, enough so to take the pool on day one. They beat Philadelphia Forge and Skyscrapers (NY) both by sizable margins. Meanwhile, no. 1 Happy Cows (CA) could not defend their seed, having lost some of their star players from last year’s event, and took losses to the same squads Superior bested. Happy Cows went down swinging, but is relegated to the bottom of the pool after just two rounds of play. Forge and Skyscrapers match up Sunday with a spot in the quarterfinal round of the championship bracket on the line, and the pair seem pretty evenly matched, making it one of the most exciting Sunday pool play games on the slate. It was a case of the haves and have-nots in the winds of Blaine, as DiscNW Bankroll (WA) and POWERLINE (CA) both registered big wins over Madison MUFAbots and Swing Vote (DC). 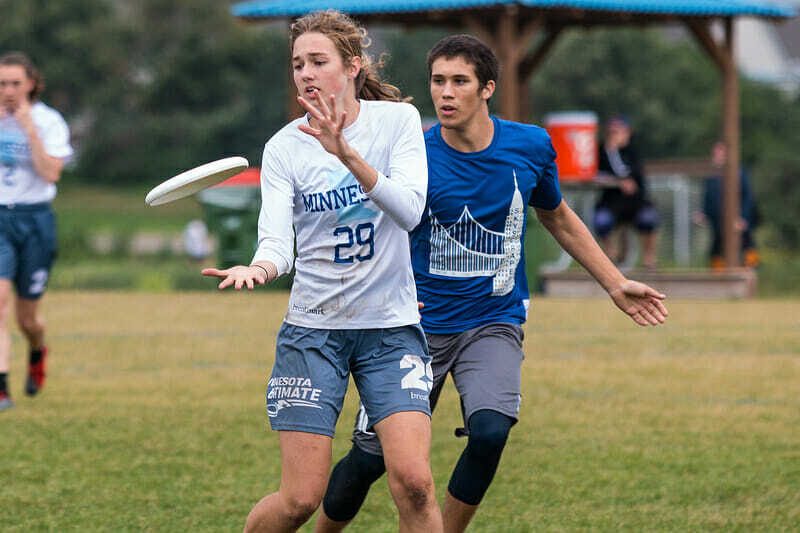 Bankroll’s Abby Hecko and Otis Williams kept the offense moving whether it was upwind or downwind in the Seattle team’s 15-1 win over Swing Vote and 14-5 success against Madison. POWERLINE managed similarly uncontested victories, with a +17 score differential. Bankroll and POWERLINE draw one another in a matchup to decide who wins the pool and who has a tougher path to the YCC title in the bracket. The pool was rearranged early by the success of no. 16 Equinox (VT), who notched a 13-7 win over no. 11 Rising Tide (ME) in round one. Equinox, led by Turner Allen and Eli Standard, wound up 2-0 after adding a W against WISCONN (WI/CT). Sabers (OH), aided Michael Kopachek’s play on Saturday, took down WISCONN 10-6, but dropped their matchup with Rising Tide. That sets up an interesting round to begin Sunday, with only WISCONN eliminated from contention. Granite State (NH) struggled to get things moving against both the conditions and the defenses; they only found the end zone 11 times on the day, despite beginning it as the top seed in the pool. Flood (OR) took the spot at the top of the pool with emphatic wins over Granite State and Kalamazoo United Chili. Caleb Campbell led the way offensive for Flood on the day. Cornsaw (IA) and United Chili face off Sunday morning in a game that will send someone to the championship bracket and someone to the consolation. On the boys’ side, four power pools each include three teams while four lower pools offered slots in prequarters to their top three finishers. The highlight game of the day came in Pool B between BUDA (MA) and ATLiens (GA). It was a true upwind-downwind battle between no. 2 seed Bostonians and the no. 7 Atlantans. Upwind offensive possessions were often dicey propositions, and many points were scored after overthrown downwind hucks turned into red zone chances thanks to short field turnovers. BUDA’s Zach Riley and ATLiens’ Adam Miller had a battle, making big plays against one another. Teams found ways to get to the upwind end zone, but were often challenged on the following point, including a late string of holds. But Atlanta struck last and converted the downwinder to upset Boston, 13-11. In Pools A and D, no. 1 Triforce (NC) and DiscNW Supreme (WA) took care of business with mostly comfortable wins. Both teams displayed skill and depth in their victories. 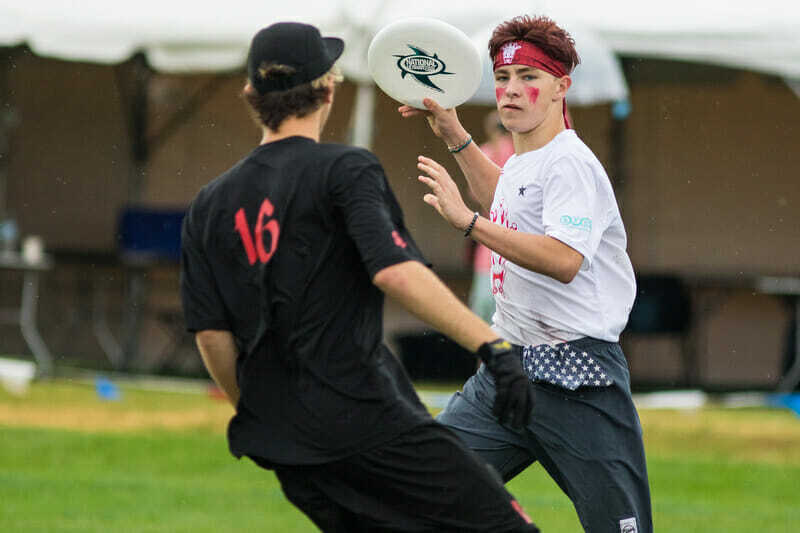 The two teams, each from youth ultimate hubs, are likely favorites after such strong starts. In Pool C, DEVYL (NJ), Impulse (PA), and Flying Pig (OH) all traded blows. Top seeded DEVYL came out on top, despite a morning test from Impulse in a 15-10 victory after a run at the end of the first half gave New Jersey the advantage they needed. The Pittsburgh team carried a late lead in their game against Pig, up 12-9, but couldn’t hold on against a late run. Flying Pig turned it around with some late breaks to win on double game point, 14-13. Utah Swarm, Red Dawn (CA), Minnesota Superior A, and Hydro (Quebec) finished Saturday with unblemished records. Hydra had the most exciting day, needing an 11-10 capped win over Illinois Youth Ultimate in which they led 10-7 but won 11-10. Thomas Dubois’ three goals did not go wasted by Hydro. For their part, Red Dawn left their competition in the dust, winning two games 15-1 and beating no. 19 Carolina Sky 15-7. Keenan Laurence and Leo Gordon were frequently involved in the scoring for the Californians, who look primed to threaten their high seeded opposition in the bracket. Comments on "Youth Club Championships 2018: Saturday Roundup (U-20)"